"The handsome home of Myron P. Bush, west side of Delaware above Summer, was built in 1859-60, from plans by J. D. Towle, a Boston architect of distinction. He was the designer of Mr. George Howard's house, and also of the William G. Fargo house. The first house in Buffalo, built in the style which Mr. Towle employed (Second Empire], was the Bronson C. Rumsey house." The Bush residence stood int he midst of five and a quarter acres, beautifully planted and kept. Mr. Myron P. Bush died in 1885, his son Mr. John W. Bush, residing there until 1896. In 1903 the property was bought by Mr. Frank H. Goodyear, and the house was torn down before the erection of the [Frank] Goodyear house, now standing [razed in 1938]." 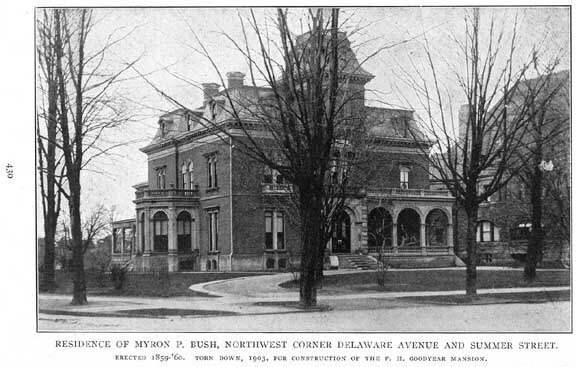 Caption: Residence of Myron P. Bush, northwest corner Delaware Avenue and Summer Street. Erected 1859-60. Torn down, 1903, for construction of the F. H. Goodyear Mansion.